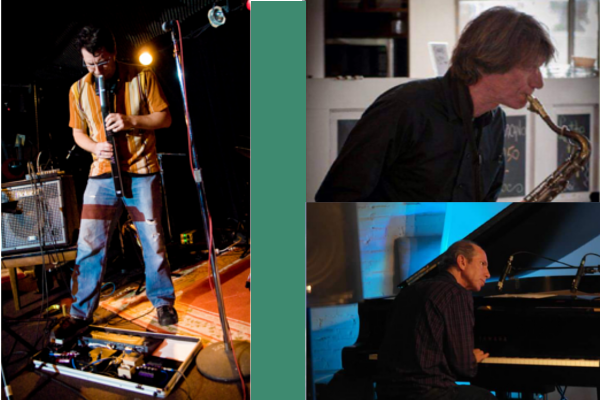 Greg Sinibaldi presents new music for trio with Sinibaldi on saxophone/ewi, Ray Larsen on trumpet/electronics and Remy Morritt on drums. The duo of saxophonist David Pate and pianist Steven Cohn create spontaneous compositions in a free jazz style as openers. Following his most recent release, Ariel, Greg Sinibaldi continues to develop music and sonic delights utilizing a unique instrument, the Electric Wind Instrument (EWI). Basically a wind driven synthesizer, Sinibaldi creates unique sonic textures. With stellar collaborators Ray Larsen on trumpet/electronics and Remy Morritt on drums expect some interesting suprises. As they have been doing for 30 years, Florida residents Steven Cohn (piano and shakuhachi) and David Pate (tenor/soprano saxophone) will create spontaneous compositions in a free jazz style, throwing themes back and forth with contagious counterpoint.